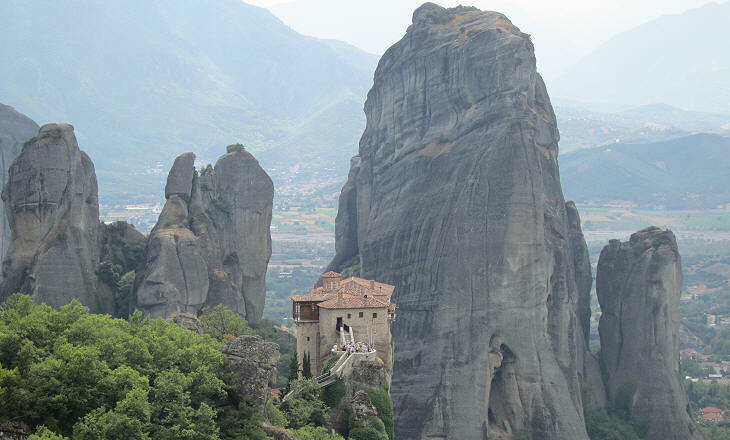 The Greek word Meteora is the plural of meteoros which means "it stands above, in the air"; it is used to design a series of monasteries built on high cliffs at the western end of a large plain in Thessaly, a region of Central Greece; the term however could be applied also to the rocks themselves when mist or clouds hide their lower parts. 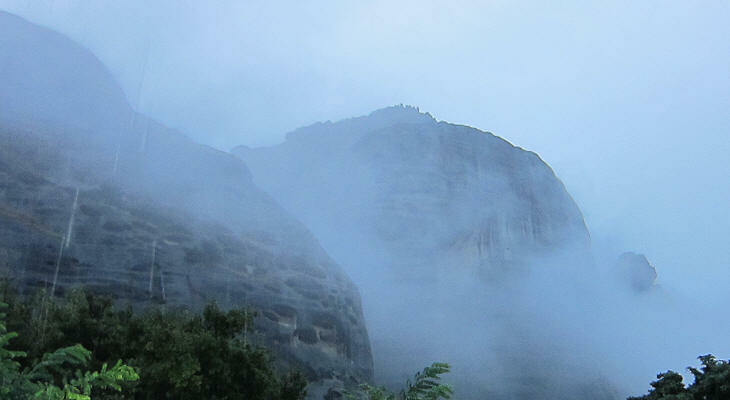 Geologists set the formation of the rocks to a time when the area was a seabed or the bed of a very large river; the sandstone was moulded into the present imposing rocks by tectonic movements; these movements created fault lines of friable materials which have been eroded by rain and wind. When seen from a distance the rocks have the appearance of an almost compact block, but deep precipices divide them into separate "towers"; the many caves existing in the rocks were used as natural shelters by the first inhabitants of the region, but when the development of more elaborate social structures led to the foundation of towns, the "towers" were not used for locating an acropolis there; reaching their top was excessively difficult even though they provided for a formidable natural defence. The erosion has led to the formation of some very unusual rocks which seem on the verge of collapsing; owing to them and to the presence of monasteries the site has many points in common with Goreme and other locations in Cappadocia, Turkey. Kalambaka (aka Stagus) is a very old settlement built on high ground between two imposing rocks; in 1835 William Martin Leake, an English antiquarian and topographer, published an account of his travels in northern Greece; he briefly described "the superb rocks of Meteora" and Megalo Metereon, its main monastery. Leon Heuzey and Honoré Daumet, two French archaeologists, published a map of the monasteries in 1876, thus contributing to making them popular in Europe. 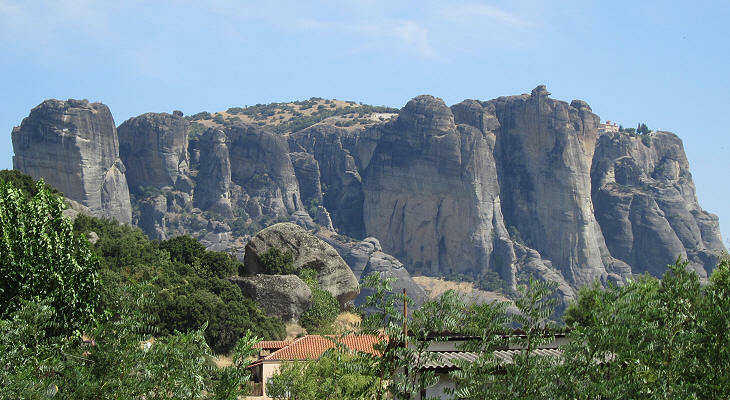 In 1881 Thessaly was annexed to the Kingdom of Greece and in the following years a railway line reached Kalambaka; the arrival of visitors led to the development of the town on the plain. 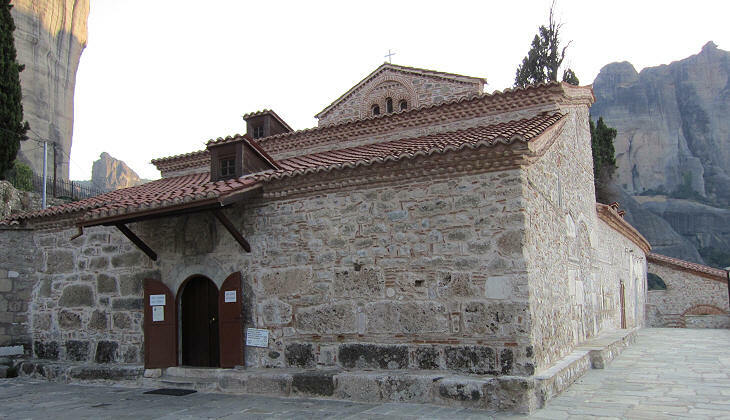 The former cathedral of Kalambaka is a very complex XIVth century building which incorporates parts of previous churches; it indicates that the town was not a negligible village; according to Leake it had been a metropolitan see, although at the time of his journey it was "a poor bishopric of the province of Larissa". Parts of ancient stones were re-utilized in the XIVth century building, which means that a town existed in the area in the first centuries AD; according to an inscription found by Leake, the town was visited by Emperors Septimius Severus and Caracalla. 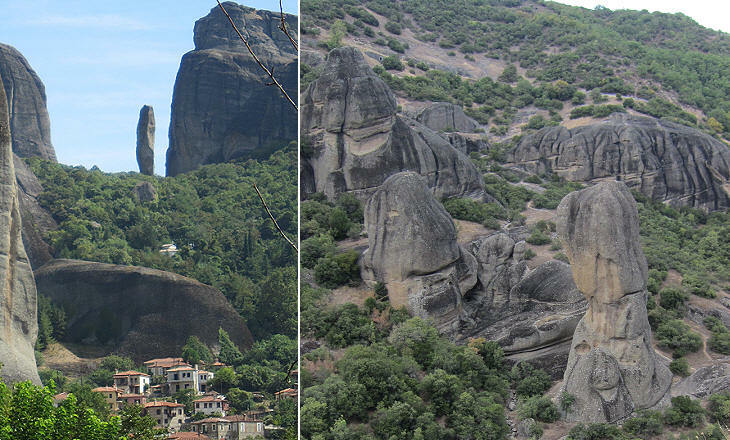 References to Meteora are made by Herodotus and Strabo, but overall the site did not attract much attention in antiquity and its rocks were not attached to tales related to the intervention of gods. This has led some early researchers to believe that perhaps at that time the effects of erosion were not as striking as they are today, but this opinion is dismissed by geologists. 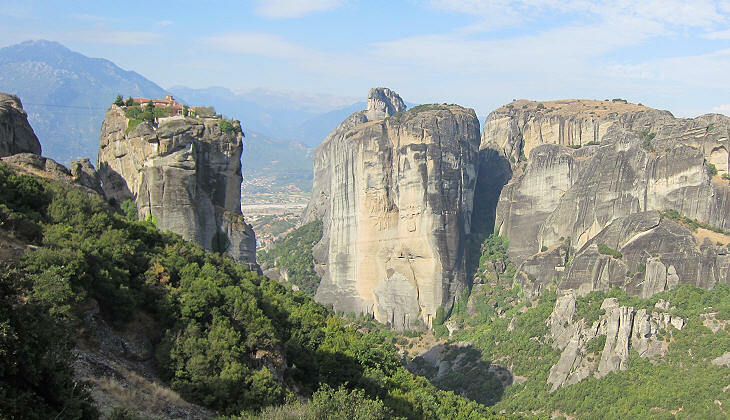 The popularity of Meteora was boosted by a 1981 James Bond's movie (For your eyes only), the final scenes of which were set at the monastery of Agia Triada. 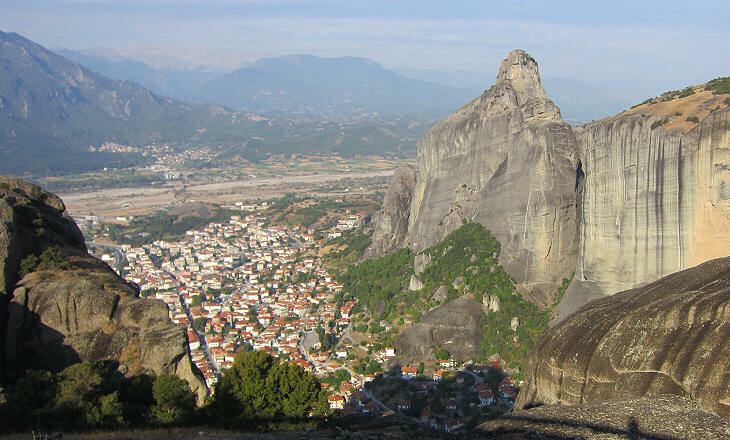 In 1988 Unesco included Meteora in the List of World Heritage Sites. 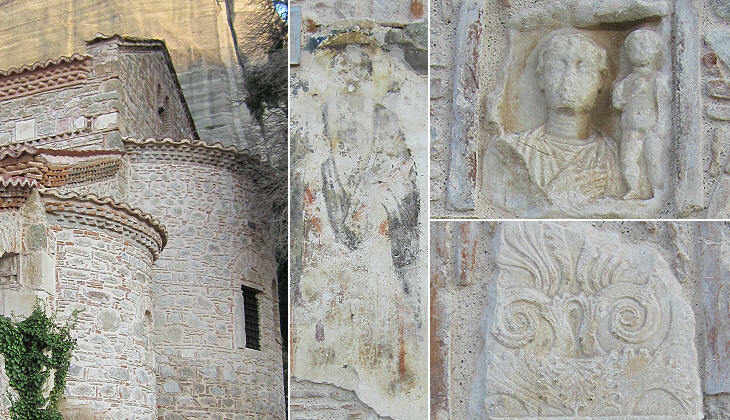 Move to page two to see the monasteries and their works of art.